Google terminated the contracts of 34 writers responsible for the voice of the Google Assistant. We’re asking for respect. We’re asking for our contracts to be upheld. 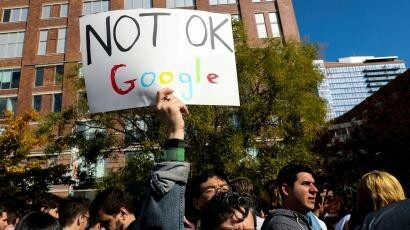 A Google worker holding up a sign at the Google walkout in 2018 that reads “Not Ok Google". UPDATE: Google sent an email to their employees a few hours ago informing us about changes they are making to improve working conditions for TVCs. These changes are significant and we're inspired by the thousands of full-time employees and TVCs who came together to make this happen. It proves that when we overcome what divides us, even a company as big as Google can be moved! However, even though these changes are an important step forward to acknowledging some of the needs of TVCs in general, there's still a long way to go. For us on the Personality Team, we are still waiting to hear back about whether the company will respect our current contracts or convert us to full time positions. We’re the Personality Team. We’re responsible for the voice of Google — the Google Assistant — across the world. We are the human labor that makes the Assistant relevant, funny, and relatable in more than 50 languages. Most of us are contractors (TVCs), a group that makes up 54% of Google’s workforce. We work on two- to six-month contracts that are regularly renewed. Our term limit is two years. Many of us work without paid holidays or health care. On March 8, International Women’s Day, nearly 82% of our 43-person contract team were told that by April 5 (in a few cases July 31) they would no longer have a job. Our existing contracts were nullified, contracts we’d been depending on as we planned our personal and financial futures. As an international team, changes in income and job status often mean uprooting our lives and our relationships to return to wherever home might be. During the process, our managers and the full-time workers on our team were silent. Google told them that offering support or even thanking us for years of work would make the company legally liable. Our teammates were told to distance themselves from us at the moment when we were most in need — just so that Google could avoid legal responsibility. For years, Google has boasted of its ability to scale up and down very quickly, and has been vocal about its ability to “navigate changes with agility.” A whole team thrown into financial uncertainty is what scaling down quickly looks like for Google workers. This is the human cost of agility. We believe that ethically scaling the growth of this company would require converting TVCs to FTE roles, not hiring and firing TVCs whenever it’s convenient. Workers, whether full time or on a contract at Google, deserve to have their agreements, rights, and dignity respected. Finally, we demand that Google respect our humanity. Implement a policy that allows our FTE colleagues to openly empathize with us; allow our FTE colleagues to say thank you for the work we’ve done.